The city of Manchester is a cycle friendly city and is awash with cycle routes for both on and off road cyclists. Cycle routes in Manchester cover most of the city and are an ideal way to explore the great city of Manchester under your own steam and at your own pace. One of my favourite cycle routes is the Manchester Airport Orbital Cycleway which as the name suggests circles the perimeter of Manchester International Airport on a designated cycle route. Manchester Airport Orbital Cycleway is Sustrans Regional Cycle Route number 65. This is my favourite cycle route in Manchester as it allows you to get up close to the runway at the airport to view the comings and goings of one of the busiest airports in the UK. 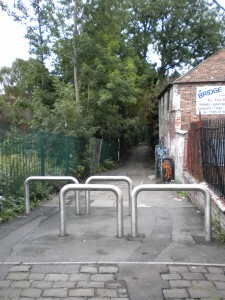 If you have the time and you get a chance to explore the various cycle routes in Manchester I would also recommend a cycle along the Fallowfield Loop or Manchester Cycleway which is a traffic free cycle path across South Manchester along the route of an old railway. This route is ideal for family cycle rides due to the wide tarmac path and traffic free environment. If you are a commuter and cycle to work in Manchester there are a number of cycle routes that lead in to Manchester city centre that follow designated cycle lanes which ensure a safe route in to work on your cycle. One of the busiest commuter cycle routes in to Manchester city centre is the Sustran Route number 6 that follows Princess Parkway. As a resident of South Manchester I commute in to Manchester along Wilmslow Road which caters for cyclists along the route. National cycle route number 6 is another great ride that takes in Manchester. Route 6 is part of a much larger path that links Watford in the South with Keswick in Cumbria. The route is a great mixture of on and off road when it passes though Manchester. I have cycled it heading North joining it near the museum of Science and Industry and following it through Salford. It reached Drinkwater Park near Prestwich and heads North over the M60 towards Bury. This is a very enjoyable route. The Trans Pennine Trail is another popular cycle route in Manchester which follows the River Mersey linking Stretford to Didsbury then Stockport and beyond. This route is part of a longer cycle route linking Southport in the West to Hornsea in Yorkshire on the East coast. For cyclists who commute to Media City from Manchester city centre there is a traffic free route along the river Irwell from Castlefield that will get you to work and back without the risks of busy roads. What ever your ability and interest in cycling make sure you get out and about on your bike and explore the many cycle routes in Manchester, you never know what you might discover.